Sculptor Luis Tapia is a pioneering Chicano artist who for forty-five years has pushed the art of polychrome wood sculpture to new levels of craftsmanship and social and political commentary. Tapia’s insightful, accessible, sometimes controversial, and often humorous pieces reflect contemporary Hispano/Chicano life in New Mexico and beyond. 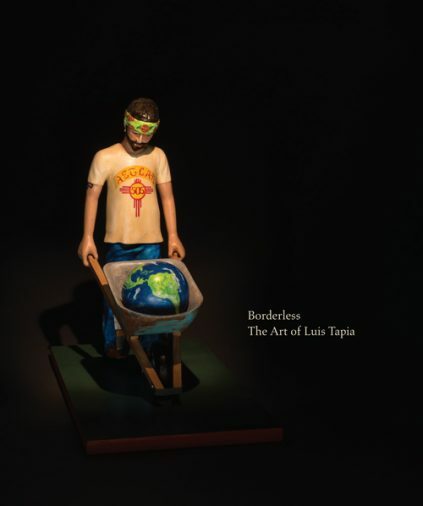 At once an artist and activist, Tapia serves as a powerful spokesperson for his culture. At the same time, his work transcends his cultural surroundings and subject matter, informing and educating large audiences of non-Hispanic viewers about Chicano culture through the elegance of his carving and eloquent social commentary. Tapia’s works have been acquired by private collectors and museums nationwide, including the Smithsonian Institution’s American Art Museum and American History Museum, El Museo del Barrio and Museum of American Folk Art in New York, Denver Art Museum, and the Autry National Center of the American West in Los Angeles. While his work has been reviewed and included in a variety of publications, this will be the first devoted to an examination of his long career. The essays by leading art historians, curators and literary figures will consider Tapia’s art both inside and outside the local and regional contexts in which it is made, and address its relevance and vitality within the broader national and international artistic conversation. Luis Tapia regards his work as an extension of the Hispano folk art tradition that was established in New Mexico in the seventeenth century and has continued to evolve over 400 years. His art combines an innovative use of materials with commentary and humor on contemporary social, political and religious issues. Tapia’s work has ranged from updated representations of saints, serious examinations of crime, pedophilia, and the Catholic Church, to parodies of politics and everyday life. His meticulously carved and painted works employ familiar details of popular culture, such as cars, tattoos, golf courses, even one’s weekly laundry, to encourage viewers to examine their own feelings about religion and politics, or simply to laugh and be entertained. Among Tapia’s most popular images are his lowrider cars and life-sized “dashboard altar” installations, both of which explore religious themes within the context of contemporary car culture. Denise Chávez is an award-winning novelist, short story writer, playwright, actor, and teacher whose work focuses on the border corridor of southern New Mexico, West Texas and Northern México, where she grew up and still lives. Her 1995 novel, Face of an Angel (Grand Central Publishing), won the American Book Award and Premio Aztlán of that year. The King and Queen of Comezón (University of Oklahoma Press, 2014) won the 2015 International Latino Book Award in Fiction and the 2015 New Mexico-Arizona Fiction Award. Chávez’s other books include Loving Pedro Infante (Washington Square Press, 2002); a memoir of her mother, A Taco Testimony: Meditations on Family, Food and Culture (Rio Nuevo, 2006); a short story collection, The Last of the Menu Girls (Vintage Books, 2004); and a children’s play, La Mujer Que Sabía El Idioma de Los Animals/The Woman Who Knew the Language of the Animals (Houghton Mifflin, 1993). Dana Goia is an internationally acclaimed American writer and poet. Former chair of the National Endowment for the Arts (2003-2009), he is currently the poet laureate of the state of California. He is author of several poetry collections, all published by Graywolf Press, including 99 Poems: New & Selected (2016); Interrogations at Noon (2001), winner of the American Book Award; The Gods of Winter (1991); and Daily Horoscope (1986). His critical collections include Can Poetry Matter? Essays on Poetry and American Culture (Graywolf, 1992), which was a finalist for the National Book Critics Circle Award in criticism; Barrier of a Common Language: An American Looks at Contemporary British Poetry (University of Michigan Press, 2003); and Disappearing Ink: Poetry at the End of Print Culture (Graywolf Press, 2004). Edward Hayes, Jr. is Curator of Exhibitions at the Museum of Latin American Art in Long Beach, California, where he has coordinated more than thirty exhibitions, including the international traveling exhibitions Frida Kahlo, Her Photos (2014) and 20th Century Masterpieces from the FEMSA Collection (2015); as well as Project Room: Marcos Ramírez ERRE; Magical Realism and Modern Oaxaca (2014); Neomexicanism (2014); Marcela Armas: Resistencia y Vórtice; Clarissa Tossin: Streamlined (2015); Korda: Revolutionary Photographer (2015); and MOLAA at Twenty: 1996 – 2016 (2016). Lucy Lippard is an internationally known writer, activist, curator and author of twenty-four books on contemporary art and cultural criticism, including most recently Undermining: A Wild Ride through Land Use, Politics and Art in the Changing West (The New Press, 2014); Down Country: The Tano of the Galisteo Basin, 1250-1782, with photographer Edward Ranney (Museum of New Mexico Press, 2010); Mixed Blessings: New Art in a Multicultural America (Pantheon, 1990); and The Lure of the Local: Senses of Place in a Multicentered Society (The New Press, 1997). Recipient of nine honorary degrees, a Guggenheim Fellowship, and a Lannan Foundation Grant, among other awards, she lives off the grid in rural New Mexico, where for twenty years she has edited the monthly community newsletter, El Puente de Galisteo. Tey Marianna Nunn is Director and Chief Curator of the Art Museum of the National Hispanic Cultural Center in Albuquerque, New Mexico. Previously, she spent nine years as Curator of Contemporary Hispano and Latino Collections at the Museum of International Folk Art in Santa Fe. She received her M.A. and Ph.D. in Latin American Studies from the University of New Mexico, her research focusing on Spanish Colonial, Contemporary Latin American, and Chicana/o and Latina/o art history and history.